Our plan for the month? Story revision: monkey-see, monkey-do style. I just finished an incredibly helpful class on novel revision with author Lani Diane Rich. I cannot rave enough about this class-- I learned so much and had a load of fun doing it! The girls have seen me hard at work and heavy-handed with colored post-it notes. They've been drooling over my story board, watching me collage, and eavesdropping on conversations between Einstein and I about plot and motivation. And some of it has been sinking in. Out of the blue yesterday Moonshine, age 7, announced that she had a really great idea that she needed to edit into that story she wrote during NaNoWriMo. 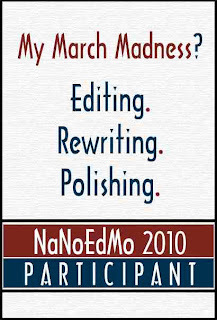 And Sunburst, age 11, immediately remembered that March was NaNoEdMo (National Novel Editing Month) and she had better get cracking on her story too! So today I started the kids off on the rewarding road to story editing. During March we've decided to have Revision Fridays... which means I get to work on my story a bit too, and while I'm awake rather than staying up all night. Yay! You are such a wonderful mom and a terrific role model for your kids (and your friends!!). :) Good luck on the EdMo!